It was a mild day in early March when my husband and I drove to Windermere, Lake District, to meet Michael Vanheste, a trained chef and the manager at The Gaddum restaurant, at Brockhole House. I’ve known Michael when he was with Northcote at Ribble Valley a few years ago. This was an experience that was long overdue. Though we had worked with Michael to design the loose leaf tea range at The Gaddum and I had tried some of its food, I’ve never had a full course afternoon tea. With the feeling of Spring in the air, I couldn’t wait to catch up with a friend and taste the new spring afternoon tea at The Gaddum. Michael is a kindred spirit. Not only is he passionate about food but knowledgeable about the stories behind their origins. His thoughfulness also extends to the surroundings, from the history of the Gaddum family, who built Brockhole House in 1897 as a summer abode, to the more-than-century-old garden and topiary designed by Thomas Moore (a famed gardener and botanist in the 19th century). The Gaddum sits on top of a knoll overlooking the scenic Windermere lake surrounded by verdant hills. The interior is designed in the Arts and Craft movement style with Tiffany chandeliers. William Morris botanic print wallpaper decorates the walls with framed vintage photographic prints of the Gaddum family hung upon them. A three tier afternoon tea stand with straight lines and rectangular shapes was specially sourced to echo the heritage of the Arts and Crafts period. 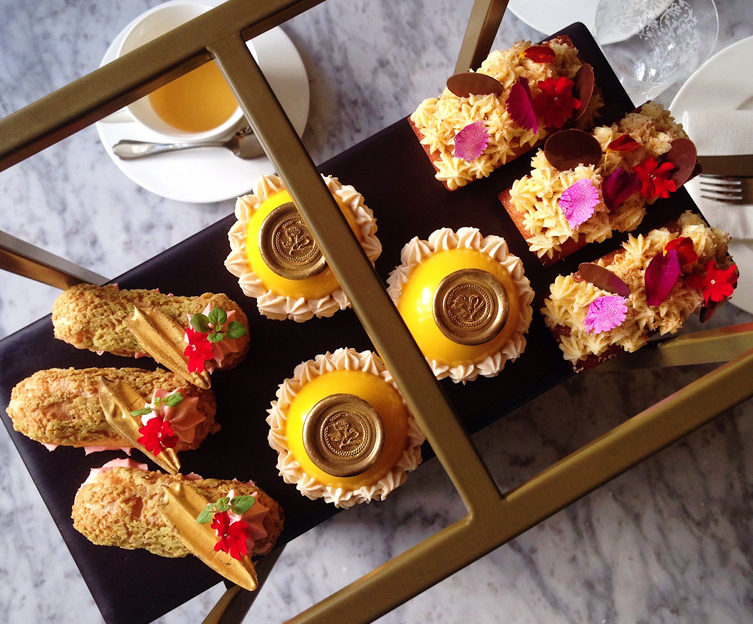 Michael Vanheste and Arts & Craft period three tier afternoon tea stand. There are only eight items in the afternoon tea menu. But the saying, less is more, is never truer here. Each item is a master creation, oozing quality and attention to taste. Relishing them and sipping with tea, the whole is greater than the sum of its parts that will satisfy a whole gamut of your palate cravings. Glossing over the finger sandwiches, make no mistake, they are as good as they come. I especially love the Yellison Farms goat cheese with homemade red onion marmalade. I’ve never imagined onion that sweet. It’s a revelation. The scones deserve a blog by itself, that’s how good they were. There’s a story behind the making of the scones and I will use pretty much Michael’s own words to describe them in a separate blog. They were suitably crumbly with the right crunch on the outside, warm and pillowy on the inside that sends you to cloud nine. This is where I must shine the spotlight on pastry chef, Zoe Louise, The three patisserie creations are exquisite in both look and taste. Rose & Cinnamon Financier – According to Michael, a “financier” is a classic French cake so called because it refers to the traditional shape of a small gold bar. It also reflected the use of expensive ingredients, such as almonds and butter in the 19th century. In the past, only wealthier individuals such as bankers and investors would have been able to afford such a luxury treat. Chef Zoe finds lots of inspiration for her creations in her travels. On a recent trip to London, Michael brought her to his favourite middle eastern haunt in the capital’s Fitzrovia district, Honey & Co., they enjoyed lunch followed by a tisane of rosewater and cinnamon and hence the idea was born. Strawberry & Basil Éclair – With her incredible sense for flavour, Chef Zoe has a knack for perfectly balancing different combinations. With the éclair, she wanted to include a treat that had a fresher, lighter and less sweet feel than the other cakes on the stand. The choux pastry (very light pastry made with egg) stays beautifully crisp because she only fills the éclairs at the very last minute. Piped inside the pastry shell, the combination of soft strawberry cream works so well with the refreshing lemon and basil gel. A light, early season strawberry compote adds a little more sharpness to this creation. Mango & Vanilla Caramel Tart – ﻿The exotic fruitiness of mango with its warm & sunny yellow colour, was the perfect choice to transition from winter into spring. Cardamom is a wonderfully versatile spice that does not have to be confined to curries, it works as a treat combined into the classic pâte sucrée (sweet pastry) that forms the base of the tart. Again, it is a balancing act so beautifully performed because the pastry case is filled with sour pineapple (flavoured with Caribbean rum, lime and ginger), rich vanilla caramel and then the lightest mango mousse, dome shaped on top. The daffodil shaped chocolate stamp completes the season’s signature. Since the writing of this blog, Michael had decided to take a short break and has left The Gadddum. He is driving from his native Belgium through Europe to Thessaloniki, Greece’s second largest city. I can’t wait to hear from him about his adventures when he’s back in the UK later this year. In the meantime, I have no doubt that The Gaddum is in good hands. Bon voyage!